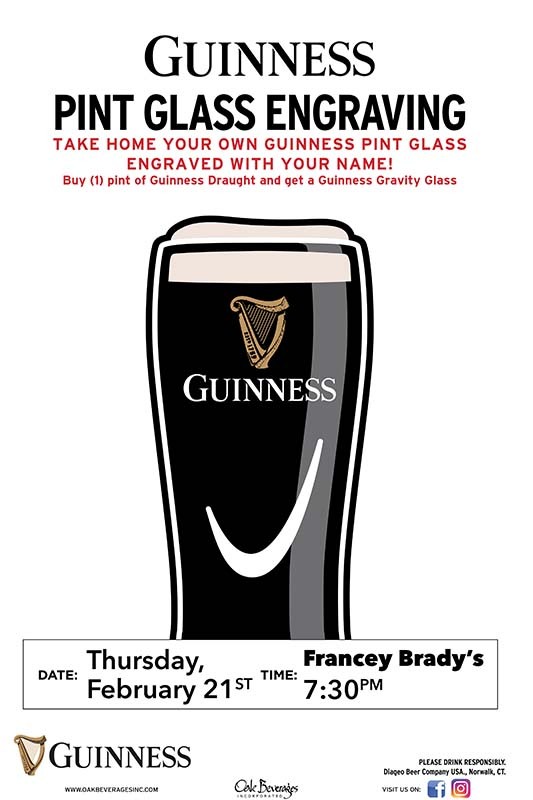 Francey Brady's Guinness Glass Engraving - Oak Beverages Inc.
Francey Brady’s Guinness Glass Engraving, Thursday, February 21st, 7:30pm. Take home your own Guinness Pint Glass engraved with your name! Buy “1” Pint of Guinness Draught and get a Guinness Gravity Glass. Rich and creamy. Distinctively black. Velvety in its finish. This iconic beer is defined by harmony. Sip after sip, sweet counters bitter as the malt arrives on cue to compliment a base of roasted barley. Just as the unmistakable white head sits flush atop the dark beer, so do the flavors counter and combine perfectly. This is our greatest innovation. Truly unique. Perfectly balanced. Made of More™. Developed in 1959, this beer was our brewers’ celebration of Arthur Guinness signing his 9,000-year lease – a fitting way to mark 200 years of groundbreaking brewing. With a skillful pairing of nitrogen gas and carbon dioxide, the smooth, velvety texture was born. Distinguished by its legendary stormy surge upon pouring, Guinness Draught brewed up a storm all of its own. It established itself as the top-selling Guinness beer with lightning speed. Drinkers were instantly drawn to its complexity; its bold combination of flavors made a lasting impression. Guinness Draught was an unparalleled success. FRANCEY BRADY’S BAR AND RESTAURANT, LOCATED AT THE CORNER OF HAWTHORNE AVENUE AND MAIN STREET, IN THE HEART OF DOWNTOWN YONKERS. THEY CELEBRATED ITS OFFICIAL GRAND OPENING ON THURSDAY, JUNE 15TH, 2017. After renovating the entire establishment and putting their own mark on the well-known corner enclave, previously named The Tyrone House, these two women entrepreneurs took stock from previous owners Mary Teague and her husband Jimmy who were proprietors for 28 years in the current spot and 58 years in the area. Wondering where the name Francey Brady’s came from? If you’re asking or wondering where the name of the bar-restaurant came from, go back in time and rent Netflix or download the classic Irish roots movie “The Butcher Boy” made in 1997 by Oscar winning and renowned director Neil Jordan. Ahead of its time by Irish standards, and a cult classic, the main character, a sharp witted, charismatic character who referred to himself as “The Incredible Francey Brady”, the co-owners just figured it was an “incredible” name to call their establishment while paying homage to the well-rounded film. Posted in Featured Promo, Glass Engraving.